(Nanowerk News) Many hands—or many flagella—make light work. In studies of the motion of tiny swimming bacteria, scientists at the U.S. Department of Energy's Argonne National Laboratory found that the microscopic organisms can stir fluids remarkably quickly and effectively. As a result, the bacterial flagella could act like tiny motors to mix chemicals in biomedical kits, among other applications. Igor Aronson, an Argonne materials scientist, and Andrey Sokolov, a former graduate student from the Illinois Institute of Technology and now postdoctoral researcher at Princeton University, piled Bacillus subtillis bacteria into thin films to decode the physics that govern how they move. The bacteria, each equipped with many tiny flagella, or tails, shot back and forth across the films. 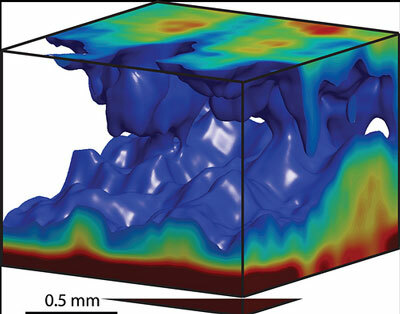 This image shows the 3-D concentration distribution of swimming bacteria Bacillus subtillis in a thin liquid film, obtained by optical coherence tomography. Two mechanisms govern the movements of bacteria in films. Like humans, B. subtillis needs oxygen to survive. In a crowded film, the oxygen levels become depleted, sending bacteria swimming up to the surface for a gulp of oxygen and then back down again: a phenomenon called bioconvection. Bacterial motion is also dictated by a principle called hydrodynamic entrainment. Bacteria whose paths cross tend to physically attract each other, and they pair up to travel in tandem across the field. Sokolov and Aronson had earlier developed a technique they called “bacteria crowd control”, a method of concentrating bacteria that uses a mild electrical current to force the bacteria closer together. They saw that concentrated bacteria self-organize into large “schools” that swim in synch—swarms of bacteria moving together, controlled by the simple laws of physics. In the current study, the researchers wanted to see whether the vigorous swimming would mix chemicals evenly throughout the fluid. “They swim so fast that we found no significant gradients of any chemical except oxygen,” Aronson said. And some oxygen mixing did occur: the bacteria improved the diffusion by 100-fold. A second surprise came when the researchers began to measure the viscosity of the fluid in which the bacteria swam. Viscosity measures how easily a fluid flows; for example, honey has a higher viscosity than water. Adding more matter to a fluid usually makes it thicker or more viscous—for example, adding dirt to water produces sluggish, viscous mud. So conventional wisdom would suggest that adding lots of bacteria to the fluid would increase its viscosity. “But to our great surprise, the fluid actually became much less viscous—by a factor of seven,” Aronson said. Thousands of tiny motors powering the bacteria actually help the fluid to flow. Aronson thinks the bacteria could be recruited as tiny micro-motors for a number of future applications. For example, bacterial mixers could combine small amounts of fluids for tests and samples. The tinier a sample is, the harder it becomes to mix; attempting to combine small samples is difficult for this reason. For small, portable on-the-go medical testing kits, which need to mix tiny amounts of chemicals, a pinch of bacteria could be the magic bullet. Two papers are referenced in this article. The paper "Enhanced mixing and spatial instability in concentrated bacterial suspensions" was published in Physical Review E and is available online. The second paper, "Reduction of Viscosity in Suspension of Swimming Bacteria", was published in Physical Review Letters and is available online.